Or view larger version. Yosemite Valley (From Below Sentinel Dome, as Seen from Artist’s Point). 1876. Thomas Hill. Oil paint on canvas. Collection of Oakland Museum of California. Kahn Collection. This painting depicts three tourists on horseback in the Yosemite Valley, below Sentinel Dome. Yosemite Valley was the first area in the country to be designated as a state park by the federal government. 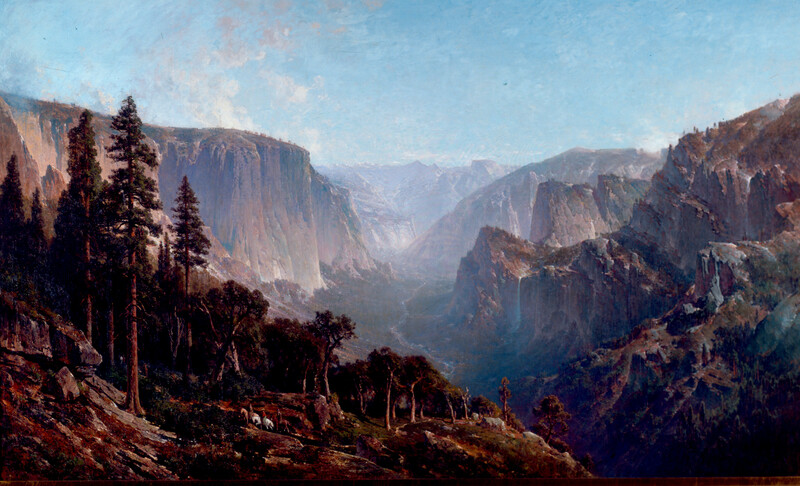 Tourism began as early as 1854 within the Yosemite Valley and by the time this painting was executed in 1876, the total number of visitors to the valley reached nearly 2,000.